Have you had a life-altering travel experience? Where did you go and what made it special? Share your adventure in the comments to inspire others. In 2003, when I was 20 and studying abroad in Italy, I got dumped for the first time. More notable than the break-up itself was its timing: my boyfriend gave me the axe the day before we were supposed to go Paris together for a long weekend. My options were to lie in bed and cry or stroll under the Eiffel Tower – alone. chose Paris. I canceled our hotel, booked a bed in a hostel and wrote sad journal entries the whole flight. By the time I was dragging myself, backpack and all, up six flights of narrow stone French steps to the tiny room I shared with two dreadlocked South Americans, my bruised heart had been downgraded as my sense of awe and excitement took priority. It was my first time in Paris, and I did most of the things one does on one’s first trip to Paris: I saw the Mona Lisa; I went to the top of the Eiffel Tower; I craned my neck to fully take in the soaring architecture of Notre Dame. I spent hours flipping through pages of old books in Shakespeare and Company as I fantasized about being one of the lucky few to live in the shop. I got fall-down depression-drunk alone at a bar in St Germain. I met a French guy on a public bus who took me to the 11th arrondissement to show me art exhibits. I sat in cafes to write and drink wine in the middle of the afternoon. I bought a baguette and cheese with a name I couldn’t properly pronounce and had a backpacker lunch in the Luxembourg Gardens. I ate long, slow dinners, always with escargot or warm chevre, and was pleasantly surprised when waiters inevitably topped off my wine glass to allow me to linger. Paris was the best place I had ever been. I’d never fallen for a city so fully and so easily – not even New York, another place I loved from the start and still call home. But Paris was Paris. It turns out all the writers are right. Paris also helped to piece back together a heart that had been thoroughly crushed for the first time. Over the next decade, I would learn and re-learn that heartbreak-sadness can feel infinite, deep enough where you wake up in the morning with the immediate bone knowledge that you simply don’t want to exist in a world without the person who left you. For that first heartbreak, Paris wasn’t just a distraction or a balm; it offered a world worth wanting to exist in. It was a reason to get up in the morning, and it was a reminder: This is here. Your reality is beautiful. It was Paris, and it was the way I saw Paris: alone. I was hooked – not just on the city, but on traveling with only myself. 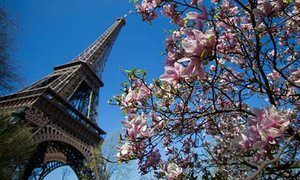 In the 10 years since, I’ve found myself back in Paris shortly after every major breakup – never on purpose, the trips just seem to repeatedly coincide with the demise of my relationships (perhaps the lesson there is that I should stop booking trips to Paris). And I’ve found myself using solo travel, and especially relocating for weeks or months at a time in a new place, as a tool whenever I need levity, clarity or escape: after finishing college and having no idea what to do with my life; upon realizing, a year in, that going to law school may have been a terrible mistake (it was); after leaving the law and setting off on an ill-defined and decidedly un-lucrative career made up of various cobbled-together passion projects, and wondering, after eating peanut butter on an apple for dinner the third night in a row, if this may also have been a terrible mistake (it wasn’t). I’ve traveled alone to dozens of places, and come to the conclusion that solo exploration is one of the best ways to learn and challenge oneself. It’s a great way to re-center, to escape from the details of daily life that can distract us from our own big picture and to come back with a new sense of self-sufficiency and purpose. And “solo exploration” doesn’t have to mean a ticket to Thailand. It can be an hour of quiet meditation, a regular dinner out, a beer at your favorite bar, your morning run down a new route, an evening in a dark movie theater. It means doing something alone that you’d usually do paired, in a way that forces you to make all the decisions and simply be with yourself. The most challenging part of solo travel, I found, wasn’t any of the things people seem to fear for women traveling alone – getting harassed or assaulted, winding up in an unsafe part of town, appearing vulnerable. The hardest part about being somewhere new alone is deciding what to do and then doing it, then deciding how long to stay and what to do next. Options are endless and there’s no one else to filter them for you. Days are wide open. There’s no one to be your companion, to determine how long is appropriate to visit a museum or a memorial, to weigh in on which restaurant looks best, to chat with while you sip your coffee. As a solo tourist, your time is entirely your own, and that can be both freeing and debilitating. That’s especially true if the rest of your life is spent serving and accommodating others – operating on a structured work schedule, meeting deadlines, deferring to the preferences of friends or a partner. Waking up in a totally new place and asking yourself, “What do I want to do today?“ is a pretty fantastic way to get to know aspects of personality and your preferences that you may not usually tap into. Same with sitting quietly at a restaurant, slowly enjoying your food and drink and being in your own head without the crutch of conversation or the weight of self-consciousness. There’s nothing particularly brave or novel about women traveling on their own. But most of the solo-traveling women I know will say there is something notable and a little transformational about the process. You have to make all your own choices, and that’s harder than it sounds. You have to feel brave enough to walk out alone when you don’t know where you’re going, and remember that no one is actually looking at you when you eat lunch by yourself. And you have to be open to the characters who will cross your path, because no traveler has to be alone for long. These companion angels have come to me in a lot of different forms: the pack of teenage girls who walked me around a cemetery in Cairo; the five Italian guys who spotted me drinking wine and brought me to one of their uncle’s restaurants for a four-hour lunch in San Gimignano; the tiny German woman who stuck with me for days from Zagreb to Dubrovnik and bailed right before I got on a bus to Kosovo; the Berlin bartender who giddily dragged me to half a dozen bars in Neukölln and told me he loved me before I realized he was impossibly high but incredibly fun; the hostel owner in Belgrade who checked my passport, saw it was my birthday and surreptitiously bought me a cake and organized a dozen hostel-dwellers for a night out dancing on the boats-turned-clubs on the Sava. You have to be careful, sure, and go with your gut if someone seems weird. But an openness to others is part of the process of getting to know a place. Allowing benevolent if sometimes odd strangers to come into (and then exit) your orbit is part of the process of getting to know yourself. Most of the day-to-day of solo travel, of course, isn’t drinking with irrepressible German bartenders and enjoying hours-long free lunches prepared by old Italian men. It’s dragging your own damn suitcase up and down the stairs. It’s trying to determine if that look the waiter is giving you be meant to convey pity or annoyance. It’s getting charged more because the standard rate for whatever thing is set for two. It’s getting lost, again, without a travel companion to blame, and not speaking the language, and cursing this godforsaken backwater town for having street signs that make no sense, and mentally composing a strongly-worded letter to Lonely Planet for having a stupid outdated map and listing an address that clearly doesn’t exist, and being so frustrated it’s all you can do to not sit down in the middle of the street and cry Folk Fests. And then it’s the moment of: I am here, right now, doing this. It’s the moment of: I am not crying. I am still walking.